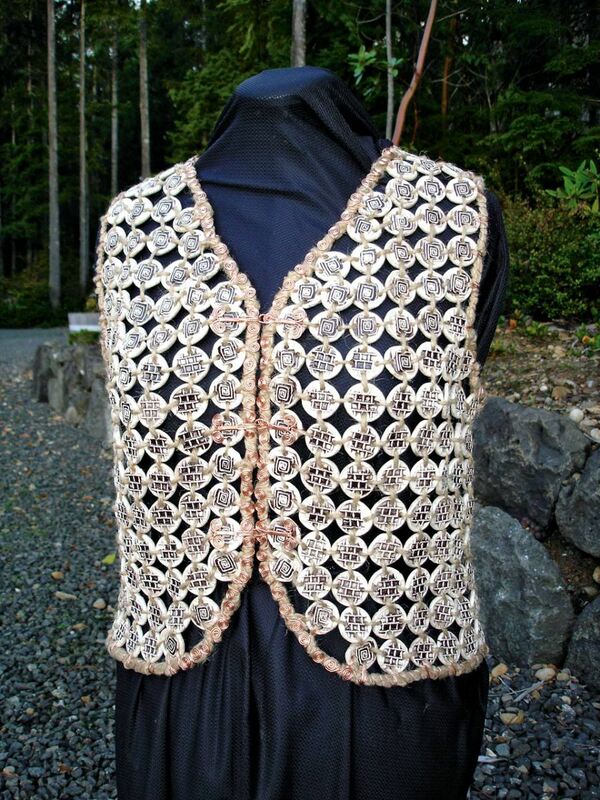 Terry Logan (formerly Terry Nokell) was only 5 years old when she first used a needle to sew. 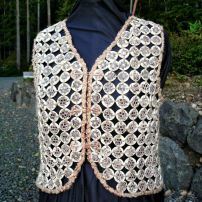 With scraps of burgundy corduroy and flowery-indigo cotton left from her outfit for a kindergarten photo, Logan decided to make herself a vest. Of course, at that age, she had no understanding of scale — the project resulted in a purse with a button. Far from being disappointed, Logan was hooked, and by age 12 had her own sewing machine. Decades later, she is still passionate about fabric. Her creations are quite sophisticated and unique, but that child-like curiosity to experiment with new things has never stopped. “My parents let me try anything, even when I was young. If I expressed an interest, they bought the supplies,” she says. 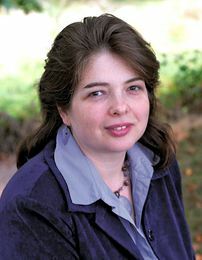 Through the years, her interests have included jewelry, pottery, rock collecting and watercolors, among other things. 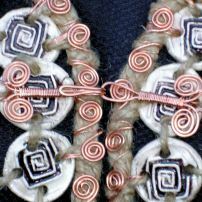 While fabric has been her focus, Logan combines other mediums, like pottery and silver, in her artistic work. 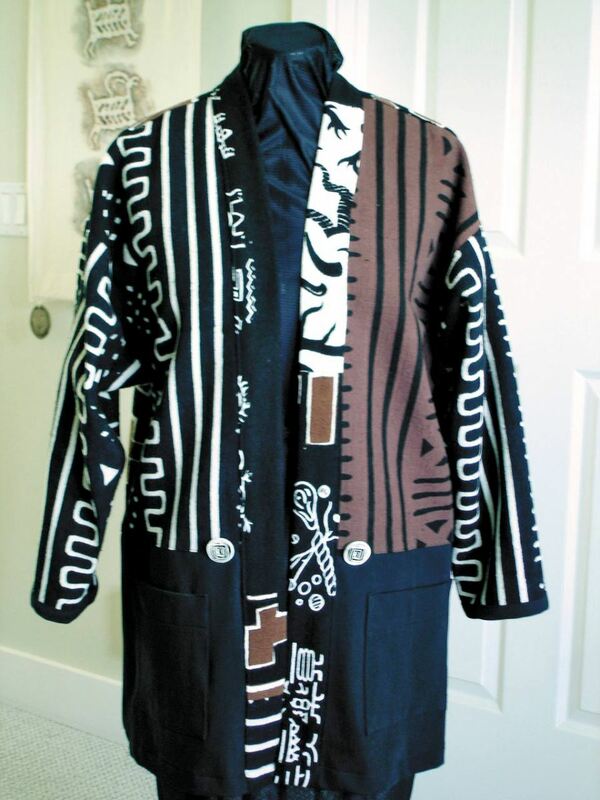 Using the business name The Logger’s Daughter, she creates original designs for boutiques and individuals using her own patterns and unique fabrics, as well as buttons, masks, silver jewelry and other things. “The fabric definitely speaks to me,” she says. “Sometimes I see the thing for it (right away) and sometimes I just want to take it home. 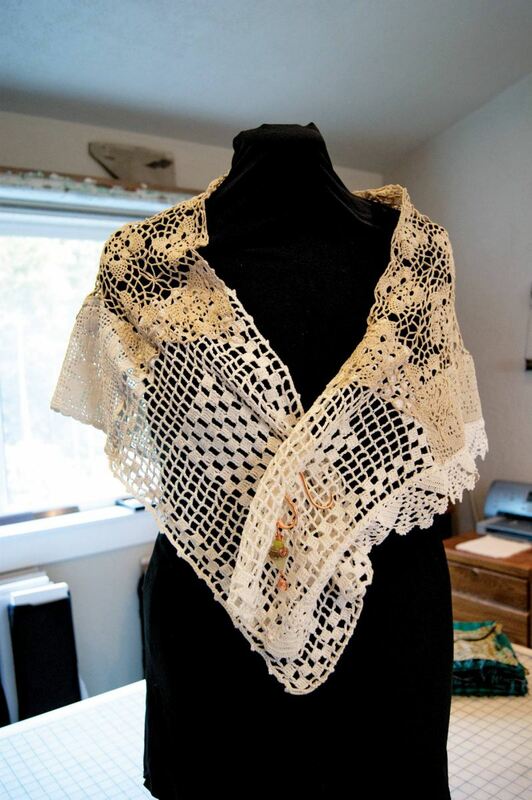 I know it belongs somewhere… A fabric may sit for two to three years, and all of the sudden the right thing will come along and it’s the perfect application,” she says. Logan comes from a family of homesteaders. 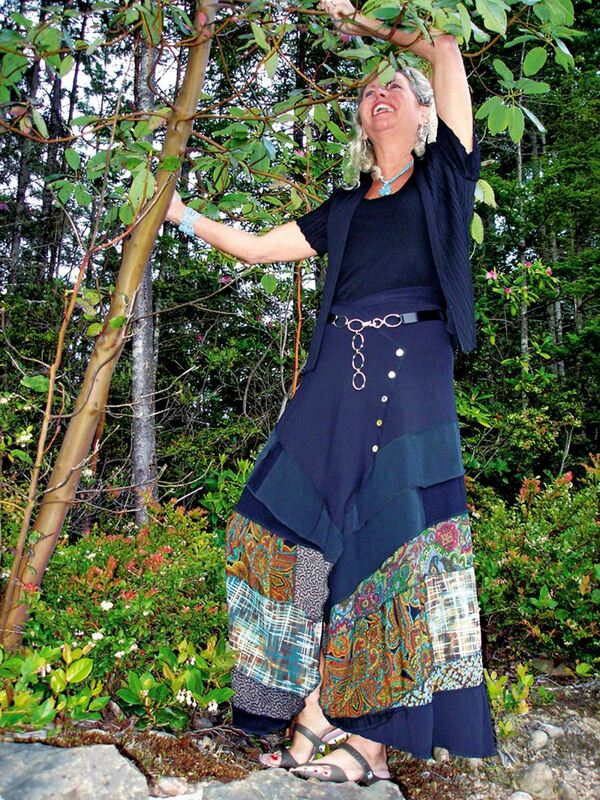 Her great-grandparents settled in the Seabeck area, picking salal and other brush. 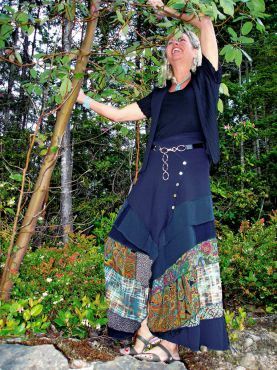 Her grandparents did some logging for Pope and Talbot (the founders of Port Gamble), as well as picking brush and selling properties, and her father, Larry Logan, became a second-generation logger. With his brother, Logan logged all over Mason and Kitsap counties, but eventually phased out of the business so his nephews could become the next generation involved in the business. Logan was adopted and raised as the only child. 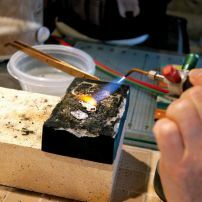 From her father — who, she says, calls himself “jack of all trades, master of none” — she has inherited both her desire to experiment and to work with her hands. The youngest of six grandchildren, Logan grew up in Seabeck and inherited land from her grandmother in the area of her old stomping grounds. She recalls learning to drive in the neighborhood where her house now stands, only in those days there were not very many homes, and her grandparents actually made the roads. She and her father built her home together over the course of three years. There, in a spacious second-story sewing studio, her fabric comes to life. Recently, Logan worked on an addition to the Seabeck property: a separate studio for Logan’s pottery work. The studio resembles a playhouse she had as a child. 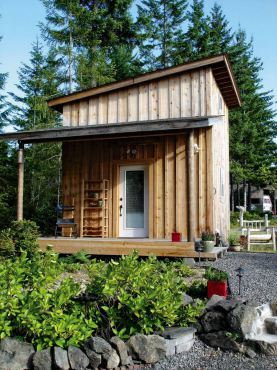 In that little playhouse, Logan would spend hours on top of the roof, or playing house in her pretend kitchen. These days, spending hours in her new space is still a habit. “Dad still calls this the playhouse,” she says. Even before going to school, she had tried her hand at several arts, and in high school, Logan took everything from calligraphy to watercolors. It was her Central Kitsap High School jewelry teacher, Bob Larson, who fostered her love for jewelry making and arts in general, and allowed her to do independent study in the work studio. “He was a real inspiration,” she says. 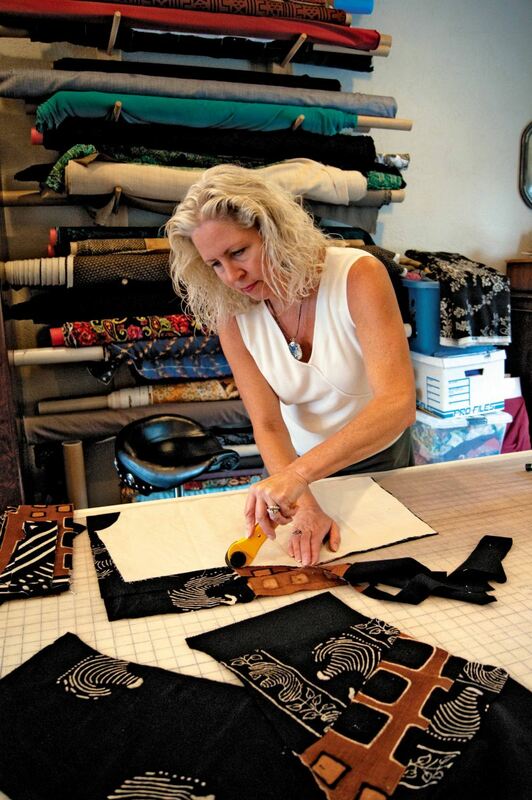 At age 11, Logan was so interested in sewing, she took four classes to learn. “That was the sum of my education,” she says. The rest was all about experimentation. Growing up in a small town where everybody shopped at the same three or four stores, she appreciated early on the ability to wear something different. “I got really hooked on having the only one thing,” she says. Even then, she didn’t stick to the mold. She used commercial patterns, but always changed something — a sleeve here, a neckline there. By the time she was in her late 20s, Logan decided to make her passion official, starting a small business to at least pay for her hobby. 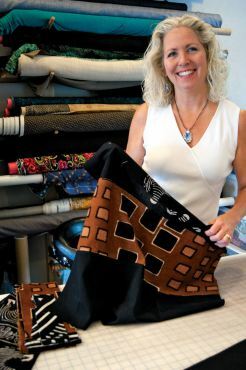 To make sure her clothes were high-quality, she went to Seattle to a fashion show and looked at garment construction to learn what a professional finish looked like. 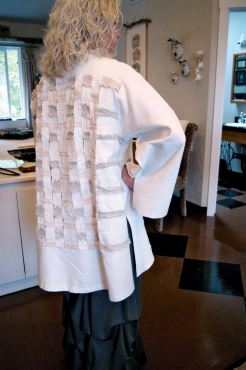 To this day, her finish work is so solid, with multiple seam stitching etc, she admits she doesn’t even like redoing her own things — and her regular customers don’t dare try to alter the clothes because of the solid construction. To achieve those effects, she’ll start the tucks below the widest point of the hip on her chandelier skirts so as to not add bulk, for example. 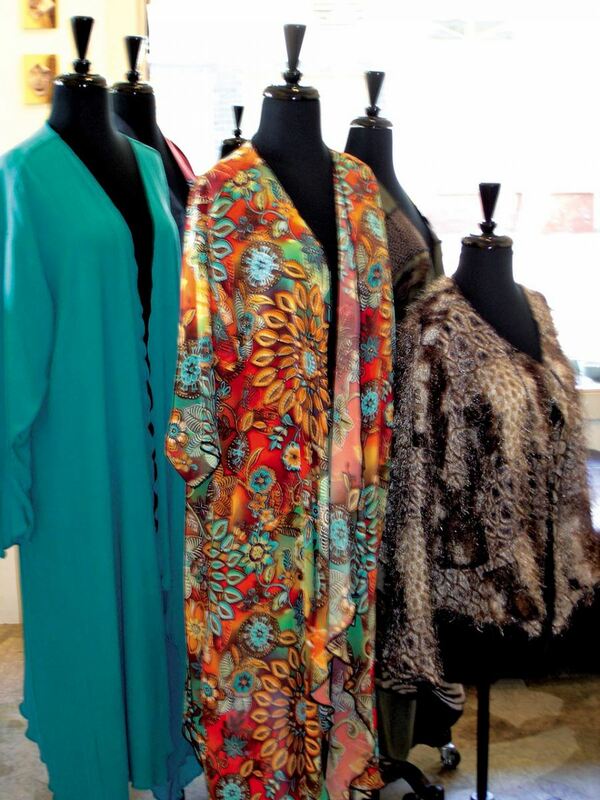 Or she’ll give the kimono jackets three-quarter sleeves so they fit petite sizes. 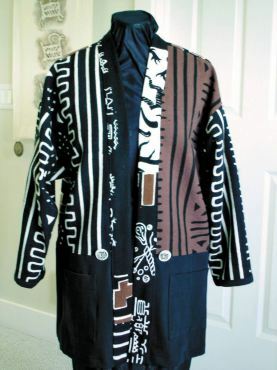 All the fabrics are pre-washed, and she only uses unique ones, such as hand-dyed African mud cloth (her favorite), custom-designed batiks, some vintage fabric (if it’s high quality), and a lot of fair-trade, handmade fabrics from other countries. 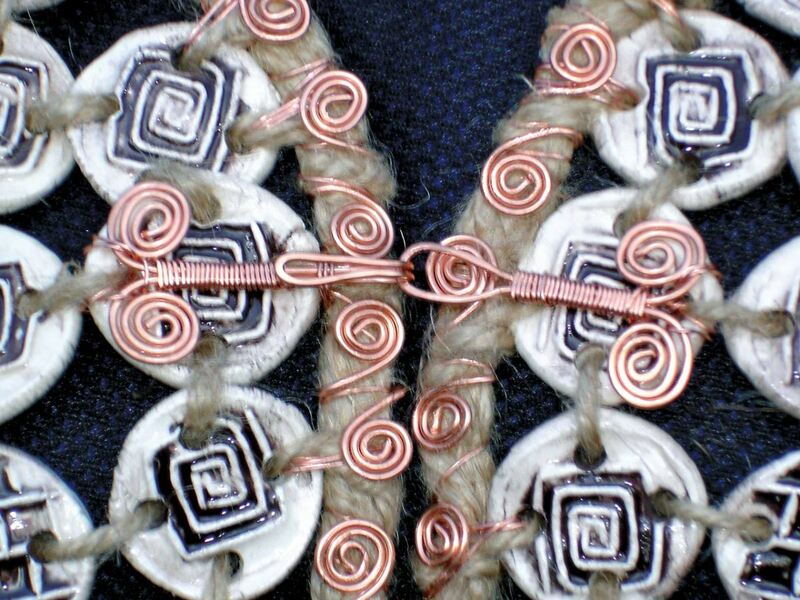 To create that story, she’ll do hand sculpting to add texture and make plain fabric come to life. 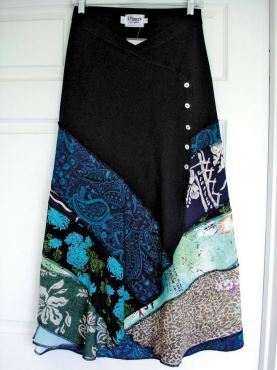 Some of the stories almost make themselves — her signature “gypsy skirts,” for example, are never alike, and the designs come alive as she makes each skirt, matching and mixing patterns as she goes along, adding each strip. 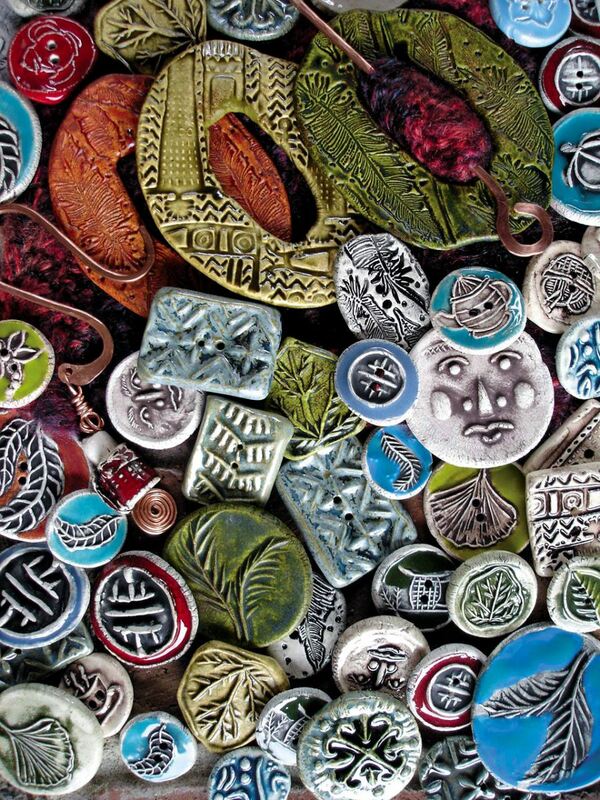 Very soon on her path of clothing design, Logan decided she wanted unique buttons for her jackets — and a one-time fascination with pottery making was rekindled. “Somebody could copy my jackets and find the same fabric, but they couldn’t combine it all. The buttons took it to the next level,” she says. 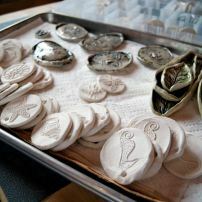 After about a year of taking her buttons to another artist for firing, she invested into her own kiln. But there was just one “problem”: Buttons were, well, boring. 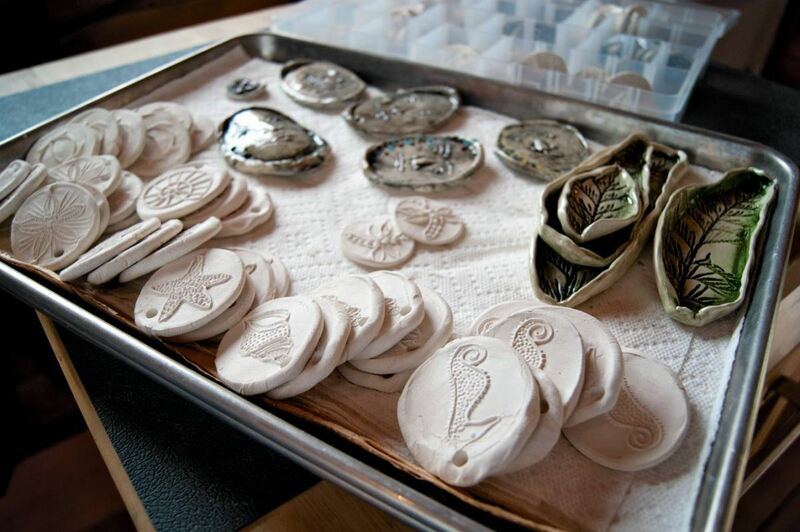 “Buttons are not terribly exciting so I started putting in another piece, like a dish or mask, so I could look at something exciting when I opened the kiln,” she says. 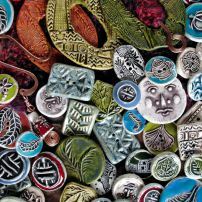 Just like she makes her own clothing patterns out of muslin — she has a collection of at least 20 mainstays — Logan makes her own hand-carved stamps for her pottery work, which has digressed, among other things, to shawl pins, pendants and even some tiles. For the past year, Logan has been making extra buttons to sell to specialty shops, and her masks can also be found at local galleries. And that wasn’t the end of the evolution. 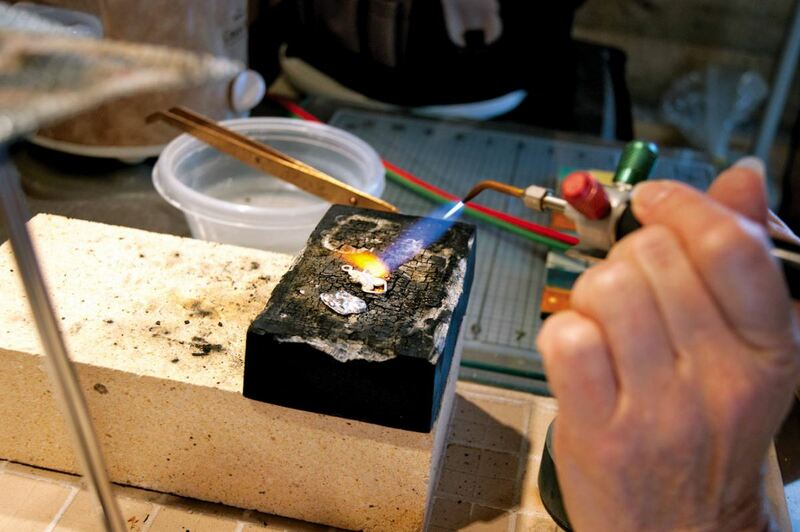 When she started making shawl pins, she got into pounding her own copper. 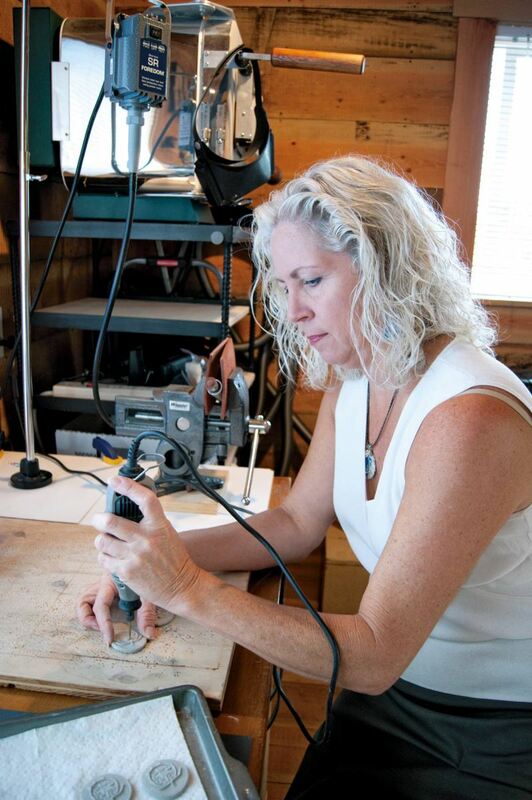 A couple of years ago, she resurrected yet another high school interest, jewelry making, and now does silver pieces. 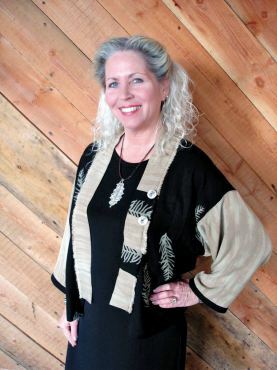 The Logger’s Daughter fashions and other creations may be found locally at Elandan Gallery in Uptown Gig Harbor, Amy Burnett Gallery in Bremerton, Old Town Custom Framing & Gallery in Silverdale, and Maricee Fashions in Port Townsend. Terry Logan has also shown her work during the Arts in the Woods Studio Tour in Poulsbo. 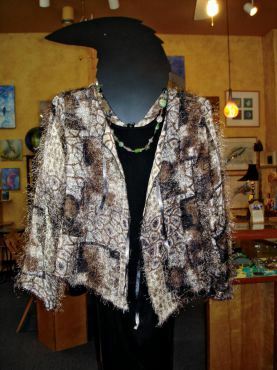 She is represented by galleries in Hawaii and other out-of-state shows. For more information, contact Logan at her website: www.theloggersdaughter.com. Logan is fascinated by good design in everything she sees, and feels that “good design is universal.” One of her design principles goes back to — surprise! — her childhood days. She recalls collecting rocks of all kind, which no doubt were ugly but in her little girl’s mind, were the prettiest thing on Earth. As an adult, she still likes to dig around for fossils, and uses pietroglyphs as inspiration for her designs. 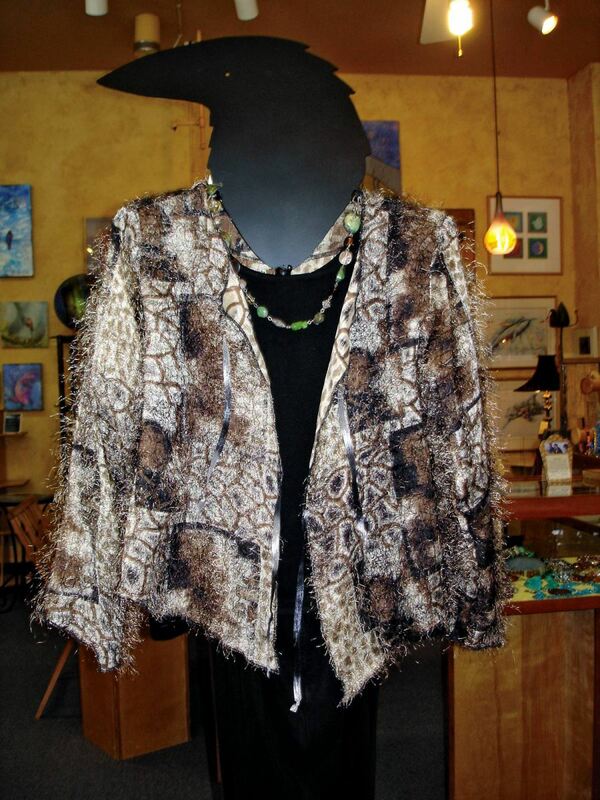 “Making a statement” is a description that fits The Logger’s Daughter artistic creations perfectly. 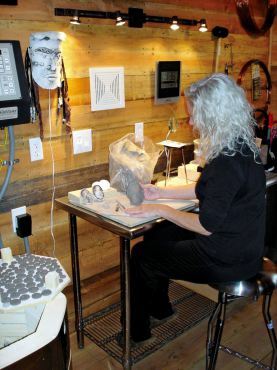 As she envisions adding yet more mediums to her palette — she may do some lampwork in the future, among other things — Logan loves the creative license she holds in all her work. The journey that started as a 5-year-old finding her way around a scrap of fabric continues, as does the evolution of Logan’s talents.